A hair-raising debut, both unsettling and addictive...A chilling thriller that will keep you reading long into the night. Mary Kubica, "New York Times" and "USA Today" bestselling author of "The Good Girl"
"Brilliant, chilling, scary and unputdownable." Lesley Pearse, bestselling author of "Without a Trace"
"You ll love this." "The Sun"
You d like to get to know Grace better. But it's difficult, because you realise Jack and Grace are never apart. Some might call this true love. Others might ask why Grace never answers the phone. Or how she can never meet for coffee, even though she doesn t work. How she can cook such elaborate meals but remain so slim. And why there are bars on one of the bedroom windows. 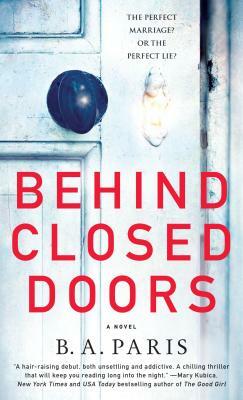 ""Behind Closed Doors" gives us a glimpse into the realities of a "perfect marriage," with addictive and heart pounding moments guaranteed to have you looking at your friends and neighbours differently." Margaret Madden, Bleach House Library.